Update from 16th of October: Today education of wilderness advocates continued at Uzhhorod specialized school 6 “Leader”. It was exciting and teenagers learnt more about Human-Wilderness coexistence. European Wilderness Society´s exhibition will be opened for scholars, their parents as well as for educators at this school until 19th of October. Due to our daily work in different European countries, the European Wilderness Society understands the importance of Wilderness Education. In fact, we can solve many human – large carnivore conflicts and many ecological challenges if decision-makers would have more knowledge about the topics. Also most human – wildlife conflicts are actually human – human conflicts. Therefore, we also start with the Wilderness education of our young generation. 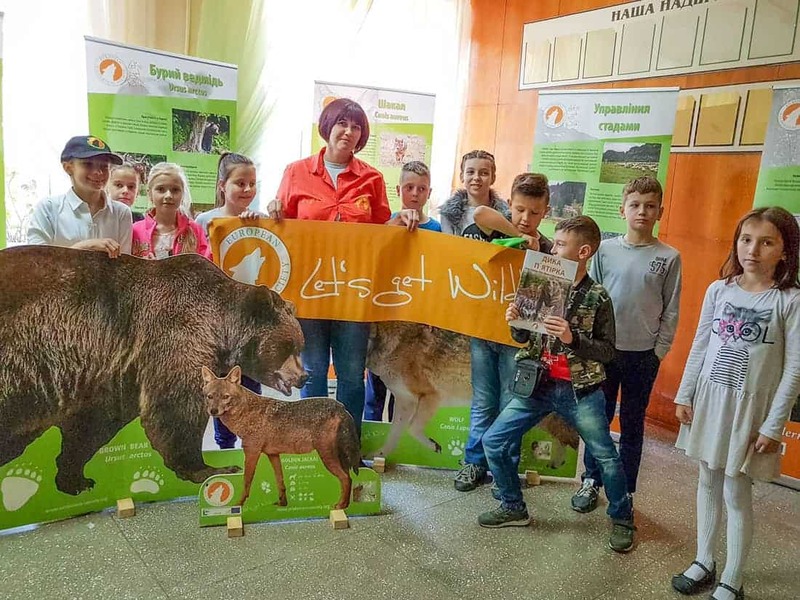 As a part of our school visits in Ukraine, on October 11th, European Wilderness Society conducted a training at Uzhhorod school 6. Students of this school had a Sustainable Development class, which fits nicely with the information of our human-wildlife coexistence exhibition. Students were able to find many answers to the discussed questions on the information roll-ups of the exhibition. And of course, the group was excited to receive a special present from European Wilderness Society. You are doing good and very important job! Thank you all! The kids are happy. On forthcoming week European Wilderness Society will visit the next school. Our travelling Human-Large Carnivore Exhibition will join us, and the living in harmony with Wilderness and Large Carnivores will be discussed. Our informative Wild5 Journal is already widely distributed across many regions of Ukraine. If you would like to support this project, any contribution to print more Wild5 Journals is appreciated. Our work depends on your continued support for Wilderness. Please donate your preferred amount!